This glossary of foundation repair terms is a resource tool to use when researching common foundation repair methods. If you have any uncertainties about the foundation repair process, contact us. We also invite you to read our Solid Foundations blog as well as our FAQ page to gain a better insight into our approach to repairing foundations in the Metroplex. Beam – When used in a pier and beam home, this term refers to a wooden member consisting of two or more pieces of dimensional lumber (such as 2’ X 6’ pieces) sandwiched together in order support the floor joist and the load of the structure. It is commonly referred to as a “girder.” Where slab foundations are concerned, a concrete beam is the thickest part of the concrete slab. It is generally installed around the perimeter of the foundation and traverses the slab in order to give it added strength and rigidity. The beam is reinforced with post tension cables or rebar. Below Grade – Below ground level. Berm – A heap of soil placed near a structure in order to direct the flow of water away from the structure. 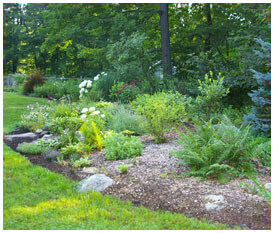 Berms can help prevent foundation damage and also enhance landscaping. They serve other purposes, too. For more information, study our drainage correction page. Clay Soil – This soil, which is commonly found in the DFW area, is “expansive,” meaning it gains and loses volume depending upon whether it is wet or dry. It is a naturally occurring mineral. Clay soil has a very strong absorption level and as a result, the soil can swell a great deal when wet. When the soil eventually dries, it shrinks (or contracts) and this causes foundation cracks. Clay is composed of hydrated aluminum silicates. Concrete Breakout – A term used to describe what must be done when a pier is located in an area that is obstructed by a concrete surface such as a sidewalk or porch. Consolidation – The change in soil volume due to the gradual loss of water. Where clay soils are concerned, this would result in shrinkage. Deflection – The degree to which a structure is affected by a heavy load. In other words, the amount of bending or bowing that a foundation may exhibit. Engineers Report – This is a report that is prepared by a licensed structural engineer outlining what is wrong with your foundation and what steps should be taken to repair it. The report typically concerns only those areas related to the substructure of the house. 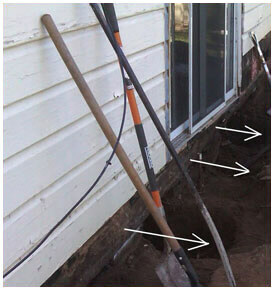 Many DFW cities require engineer’s reports before beginning the process of foundation repair. Do you want to find out if your DFW city requires an engineer’s report? If so, please visit our foundation repair permit resource page. Footing – A very thick concrete slab that is placed around the edges of a foundation. The purpose of a footing is to evenly spread the load (or weight) of the structure. It is usually 12-14” wide and is positioned under a perimeter beam. Footings are installed below grade (below ground level). Girder – A beam that is generally made of wood and whose purpose is to distribute the weight of the structure to the foundation resting below it. A double 2’ X 6’ girder is typically the minimum size used. Grade Beam – A concrete support that wraps around the perimeter of a pier and beam foundation. It is generally poured approximately 18″ below soil grade and reinforced with rebar. Hydrostatic Plumbing Tests – Tests performed by licensed plumbers using special equipment to determine if a property has under-slab plumbing leaks that can cause foundation damage. These tests are generally conduced before and after foundation repair. Load Bearing Capacity – The maximum amount of weight that a foundation can support without experiencing foundation failure. Too much weight will cause the soil beneath your structure to shift. Moisture Content – This generally refers to the amount of moisture in the soil around your foundation. Soil with high moisture content expands. Pier And Beam – A type of construction that is generally used when building houses. Unlike homes built with concrete slabs, pier and beam structures are elevated and have a crawlspace beneath them. The crawlspace is usually 18-24” high and allows for easy access to the utilities beneath the house. Pier and beam houses almost always have wooden floors. To learn more, please study our pier and beam foundation repair page. Point Of Refusal – This describes how far piers can be pushed into the ground without breaking or causing the foundation to move in an upward position due to the hydraulic system being used to install them. 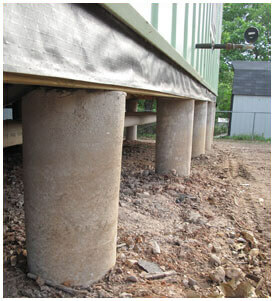 Contractors push piers as far down as possible without negative results. Pressed Piers or Pilings – Pre-cast concrete cylinders that are approximately 6” in diameter and 10” long that are hydraulically pushed into the ground to the “point of refusal” and stacked one of the top of the other. The weight of the house or structure is what keeps the piers in position. Their purpose is to stabilize a foundation. In the DFW area, they are typically driven 10-15’ into the ground. In some DFW cities, such as Irving, they may be installed as deep as 22’. 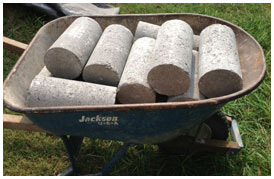 Would you like more information about pressed concrete piers? Root Barriers – Barriers (or walls) that are created using plastic, plexiglass or metal that can withstand moisture and the effects of soil without corroding. 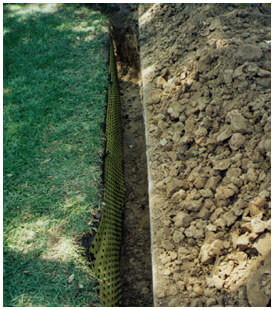 The barriers are installed deep in the ground surrounding the foundation in order to prevent invasive tree roots from growing under the foundation and damaging it. 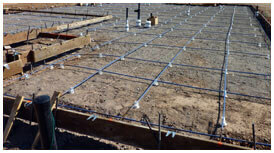 Slab Foundation – A foundation made of concrete that is approximately 3-4” thick (on a residential property) and reinforced with steel rebar or post tension cables. The slab’s perimeter beams are generally 12” X 24” and made of concrete, too. These foundations are commonly called “slab on grade foundations.” Slab foundations are generally found in warm regions such as North Texas. Do you want read more about this? If so, please visit our slab foundation repair page. Soil Compaction – Soil particles that have been forced tightly together and have very few air pockets between them. Before a foundation is constructed, the soil beneath the foundation should be compacted with machinery that rolls across the ground, dispenses moisture into the soil, and then smashes it downward to make sure it’s stable and won’t sink under a heavy load. Poor soil compaction can result in settlement and foundation damage. Steel Piers – Piers made of steel that driven all the way into the ground, to the point of reaching bedrock. In the Dallas-Fort Worth area, that may require that they be installed between 20-70” deep. While steel piers are excellent, they are considerably more costly than concrete piers. For more information, check out our steel piers resource page. Structural Integrity – Describes how structurally sound the foundation is and whether it can properly support the weight of the load as intended. Transpiration – When trees roots remove the moisture from the soil around your foundation. Under-Slab Plumbing Leaks – Leaks beneath your foundation that you may not be aware of. They occur when there is a leak in your plumbing system and water seeps beneath your foundation. Water can cause major foundation damage.